When it comes to pronunciation, this word is like the little brother of ‘ui’. Not nearly the same sound, but again very hard to pronounce for the non-native Dutch speaker. – the plural form of ‘ei’ ends in ‘eren’. However, the general rule is that a plural form ends in ‘en’ or ‘s’. 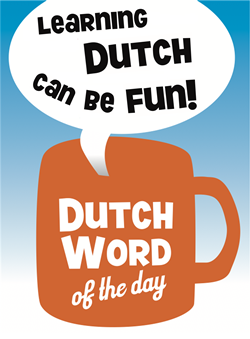 – the Dutch vowel ‘ij’ sounds the same as ‘ei’ and often leads to spelling errors. 1. Well known Dutch beer brand with ‘ei’ in it: "Heineken". 2. "Eiersalade" : egg salad/spread (also see DWOTD "Sla"). 3. "Een (zacht/hard) gekookt eitje." : "A (soft/hard) boiled egg." 4. "Twee gebakken eieren." : "Two fried eggs." 5. <expression> "Het was een eitje!". Translates to: "It was a piece of cake!" "Hoe ging je examen wiskunde? Man het was een eitje!" "De kip legt een ei." 3. "Uitsmijter" : typically Dutch breakfast order in cafes or restaurants. Consists of two fried eggs served on slices of bread (or toast) with slices of ham and/or cheese. Caution: ‘Uitsmijter’ is the noun derived from the verb ‘uitsmijten’, which means ‘to throw out’, specifically when it comes down to throwing people out of clubs or bars, hence: ‘uitsmijter’ also means ‘bouncer’. …he axyed after eggys. And the good wyf answerde that she coude speke no frenshe. And the marchaunt was angry for he also coude speke no frenshe but wold have hadde egges and she understode hym not. And thenne at laste a nother sayd that he wolde have eyren. Then the good wyf sayd that she understood hym wel… … what sholde a man in thyse dayes now wryte: egges or eyren?